SQLCMDEDITOR – Productivity Feature – Edit SQLCMD scripts in Notepad! I recently completed running a series on the “Underappreciated Features of Microsoft SQL Server”, under which I introduced the SQLCMD mode available within the SQL Server Management Studio. SQLCMD mode is a means of using SQLCMD functionality within the SSMS, which would normally have been available on the command prompt. Now, SQLCMD is a very powerful utility – highly productive and flexible. I learnt that myself when researching for the original post. Here’s one feature that caught my immediate attention, and I won’t shy away from saying that it has made me use SQLCMD even more! This works great on small queries, as shown in this example. However, what about complex or queries running into multiple lines? Those would become difficult to write on the command line. That leads us to a the need of a script editor in SQLCMD. SQLCMD comes with a set of highly commands. One such command is “[:] ED”. If we type in “ED” on the SQLCMD prompt and hit the Enter key, we find that it launches the default editor of the command prompt – the very familiar – blue & white interface! Hit “Enter” and watch the query zoom by. Now, launch the editor from the SQLCMD, and NOTEPAD would open up as the query editor. Once the query editing is complete, simply save & exit out of the editor to return back to SQLCMD. Clean Up – Where do my SQLCMD files go? We saw above that each of these SQLCMD editors create temporary files which are edited by the users. Where do all of these files go? They simply go to the path specified by the environment variable %TEMP%. Normally, after the SQLCMD session ends, this file should be removed. In case it is not removed, one can always remove this file from the user’s temporary folder. Do let me know if you have any other cool SQLCMD tricks. I will publish them on my blog with due credit. 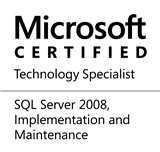 This entry was posted in #SQLServer, Blog, Imported from BeyondRelational and tagged #SQLServer on June 13, 2011 by nakulvachhrajani. command line tools are always under appreciated on windows and sqlcmd is really usefull. with this tip, it is really even more usefull!